After a very long and arduous eighteen-hour journey south consisting of a bus, an overnight train, another train, and another bus, we have arrived in Mora. 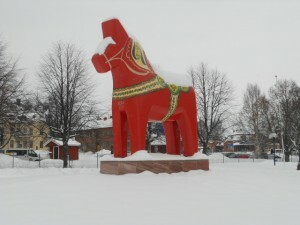 Mora is in central Sweden and home to the dala horse and the Vasaloppet, the infamous 90-kilometer cross-country ski race. This apparently is a big deal, and that fact became quickly apparent when we started talking to the students and faculty at Mora’s Folkhögskola, which will be our home for the next five weeks. After chatting with Max, who is a ski student here, and seeing the weight room where the vast majority of the equipment involves ski training in some way, the Vasa Loppet will be an exciting experience for skiers and non-skiers alike. 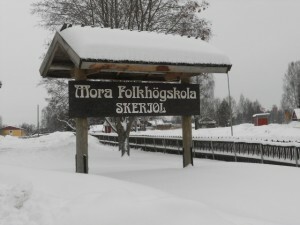 This event will take place the first weekend of March, and it brings thousands of spectators to the town of Mora. Being a non-skier myself, I will most likely be standing on the sidelines, but I am open to the idea of possibly improving my extremely inept skiing skills while I am here. When in Sweden, do as the Swedes do, right? And with achange of scenery comes a change of our living situation. Upon arrival of the folk high school (or Folkhögskola) we were informed that we would each have our own room! Although Ryan and Erik volunteered to go to the newer dorm building to share a room, the rest of us got our very own bedroom, sharing a bathroom with one other person.Speaking from the perspective of someone that loves their own space, I was thrilled; the fact that we have closets with hangers may have given me a slight tingling sensation. We were also informed that we would have all of our meals taken care of in the school cafeteria during the week, and only have to cook on the weekends. Speaking from the perspective of someone that does not really know how to cook, I was thrilled again. Mora was off to a great start in my book, aside from my extreme sleep deprivation and acquiring a minor cold from the Winter Market festivities. We started out our school week on Tuesday, with class beginning at 8:15. Oj då. I thought I had escaped the ferocious 8 am class after freshman year, but it reared its ugly head once again. Especially after not having slept on the train to Mora, it was a struggle all week to catch up on sleep. But our Nordic Politics and Religion class with Lennart proved to be very interesting, mostly because it involved European politics, which I was not all that familiar with, and thus was quite eager to learn more about. Being quite fed up with the American two-party system, I have to say the Swedish 8-party system proves to be very fascinating to me. Lennart, who is a “Super-Gustie” and has also served in theSwedish andEU Parliaments, loves Gustavus students and is a very enthusiastic instructor—class with him I predict will be both stimulating and enjoyable. Lennart’s class was followed by handicrafts, or slöjd, with Ingrid where we felted hearts in honor of Valentine’s Day that is right around the corner. This basically involved poking wool with a really sharp barbed needle for a very long time. There is just something extremely satisfying about poking something that many times with that amount of intensity; I enjoyed it immensely, and the finished product didn’t turn out too bad either. Ingrid gave us another felting lesson on Wednesday, but this time it was wet felting, and we made seat cushions. We were instructed to take pieces of dry wool and layer them in a criss-cross fashion, and then pour hot, soapy water all over it. The next few hours were spent trying to get that hot, soapy water out with some good ole elbow grease, and the finished product was about a half inch thick, perfect for sitting on. My shoulders were quite sore the next day, so I see that as a sign that I’m out of shape, but also as a smashing success. Thursday was the day of love—a holiday not really observed in Sweden, which was fine by me. 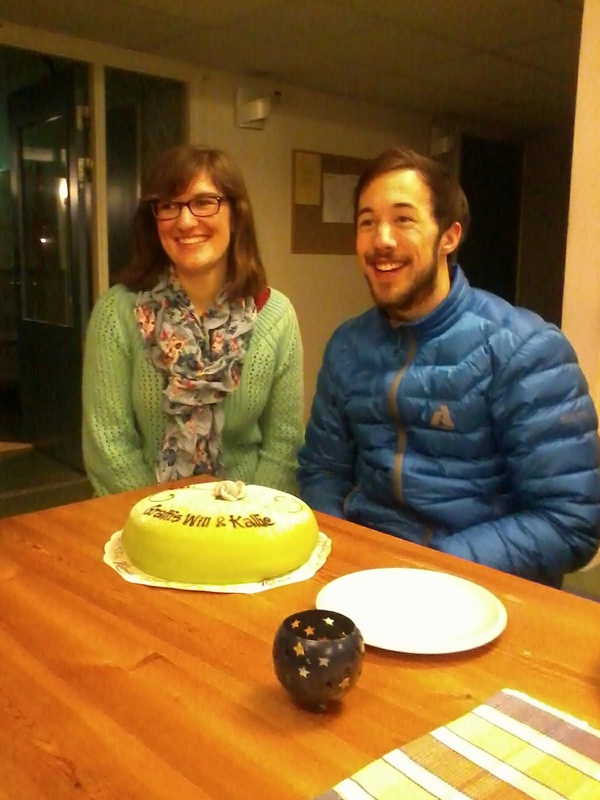 It also happened to be Will’s birthday, so we had a celebration of sorts in the dorm kitchen where we had a traditional Prinsesstårta for Will and Kallie, who have both had birthdays since we’ve arrived in Sweden. This cake consisted of a green marzipan outer shell, and a white cake and custard filling—quite tasty. Friday was a field trip that was a part of our science class, where wewalked around a village of sorts looking for animal tracks with Kjell, an ecology teacher here at the Folkhögskola. We walked for several kilometers through the woods, and then played some good old American football in the snow (using a chunk of firewood as a makeshift ball), followed by some roasted hot dogs over the fire. The American in me left very satisfied; it was a great end to a long week. Jane, Eugene, Cowboy and Christa enjoyed the humor and details in this one. I hope more treats you all well.